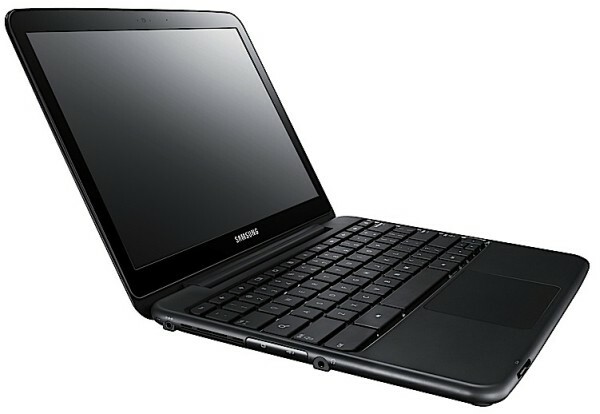 This is the Samsung Series 5 ChromeBook, which plays to Google's new standard "Chromebook" spec. It'll come with a dual-core 1.66Ghz Intel Atom N570 processor, an HD webcam, 16 GB mSATA Solid State drive and an "all-day" battery, which Google says will provide 8.5 hours of continuous usage. Samsung's particular lightweight will have a 12.1-inch screen, weigh 3.26 pounds and come with dual-band 802.11 WiFi and optional global 3G. You'll be able to order one from Amazon or Best Buy beginning June 15th. It'll cost $429 for the WiFi version and $499 for worldwide 3G -- which includes 100MB of free Verizon data per month, just like my CR-48! SAN FRANCISCO - May 11, 2011- Samsung Electronics America Inc., a subsidiary of Samsung Electronics Corporation, today announced its stylish Series 5 Chromebook, the world's first Chromebook built on the principles of speed, simplicity and security. "With the creation of the Series 5 we are again pushing the boundaries of innovation by introducing an entirely new product category to the notebook market," said Scott Ledterman, director of mobile PC marketing at Samsung Enterprise Business Division. "This partnership has allowed us to combine Samsung's design and engineering expertise with Google's simple, secure software to provide consumers with a revolutionary notebook to fit today's web-centric lifestyle." "Samsung's reputation for innovative design and hardware development makes it a great partner to introduce one of the first Chromebooks," said Caesar Sengupta, Director of Product Management, Google. "We look forward to bringing a much better computing experience built around the speed, simplicity and security of Chrome." With its elegant shape, slim 0.79-inch body and simple Titan Silver or White finish, the Samsung Series 5 Chromebook embodies fashion and function. The 12.1-inch Super Bright display is both anti-reflective and anti-glare for a consistently vibrant visual experience across a variety of light conditions, from outdoors to dimly lit environments. The Series 5 display's 300nit brightness brings all forms of media alive in vibrant color. The Samsung Series 5 packs power with an Intel® Core™2 Duo N570 1.66Ghz processor, giving you the versatility and performance you need for a one-of-a-kind web experience. Google developed the Chrome operating system with three key factors in mind: speed, simplicity and security. The average out-of-the-box laptop starts up in 45 seconds. By contrast, the Series 5 starts up in less than ten seconds. When waking from sleep, a user simply opens the lid, and it's ready to go. This means that wherever you are and whatever you're doing, your computer won't slow you down. For a secure experience, Chromebooks run the first consumer operating system designed from the ground up to defend against the ongoing threat of malware and viruses. They employ the principle of "defense in depth" to provide multiple layers of protection, including sandboxing, data encryption, and verified boot. The Chromebook has also reduced concerns about security and data loss by moving everything to the cloud. If the Chromebook is ever broken or lost, all of your files are saved online. The Series 5 enables today's digital entertainment lifestyle by simplifying browsing, social networking, application usage and multi-media viewing. An optional VGA adaptor can connect to a second monitor or television, while audio inputs connect to a microphone, headphones or external speakers. The HD Webcam completes the Series 5's audio-visual package. When there isn't time for entertainment, the Series 5 can get down to business. Productivity is enhanced with the Chromebook's stylish and comfortable island keyboard, which delivers performance that can't be matched by a virtual keyboard. Samsung Series 5 will connect you to your data anytime, anywhere through 3G, WLAN and a 4-in-1 Card Reader. Verizon Wireless has partnered with Samsung and Google to provide 3G connectivity for the Series 5 in the U.S. Verizon will provide up to 100MBs per month of Mobile Broadband service included with device for two years. Simple and easy additional data packages are also available for users requiring additional space. The Samsung Series 5 will launch in the U.S. June 15, 2011 from Amazon.com and BestBuy.com. The Wi-Fi + 3G model will retail at $499.99, and the Wi-Fi only model will retail at $429.99. Specifications and designs are subject to change without notice. Non-Metric weights and measurements are approximate MB = 1 million bytes, GB = 1 billion bytes, TB = 1 trillion bytes. *Battery life will vary depending on the product model, configuration, power management settings, applications used, and wireless settings. The maximum capacity of the battery will decrease with time and use. Test results based on independent third party Mobile Mark (or Battery Mark) tests. Total amount of available memory may be less based on configuration.